Last year, my friend, Cathy, made a cranberry salad for a Fall get together. It was yummy so I asked for the recipe. It is very easy to make, but should be made 2 days in advance of when you wish to serve it for the flavors to properly blend and for the salad to set up firmly. So start on Tuesday if making for Thanksgiving dinner on Thursday. This is also a great use for fresh cranberries (other than stringing them for holiday decoration)! 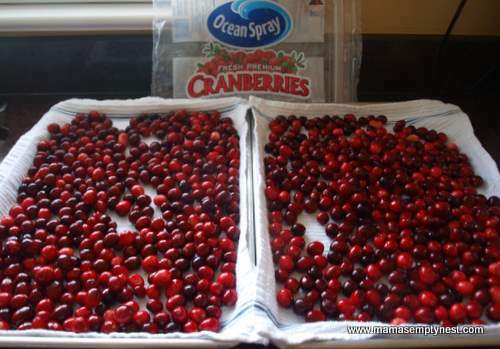 If you want to find other recipes for fresh cranberries, visit the Ocean Spray Cranberries site. Let’s get started on making the Cranberry Salad! 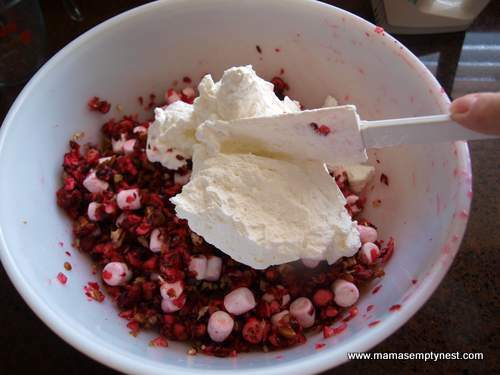 Cranberry Salad ingredients – fresh cranberries, sugar, whipping cream, pecans, and miniature marshmallows. You gotta know that any holiday recipe that calls for whipped cream and miniature marshmallows is going to be good! 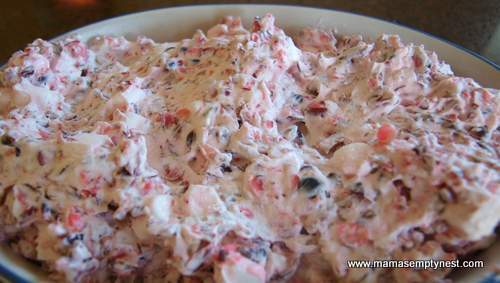 This recipe, as listed, makes a large batch of cranberry salad, but this recipe is easily halved so if you are planning to have a lot of sides at your Thanksgiving meal, a halved batch will serve more than six. First of all, rinse and drain the cranberries. I placed the washed berries onto towel-lined sheet pans to allow them to dry. It also made it easier to pick through them to discard the overripe and under ripe berries. Just run your hands, gently, across the tops of the berries, and you will be able to feel the ones that should be tossed. 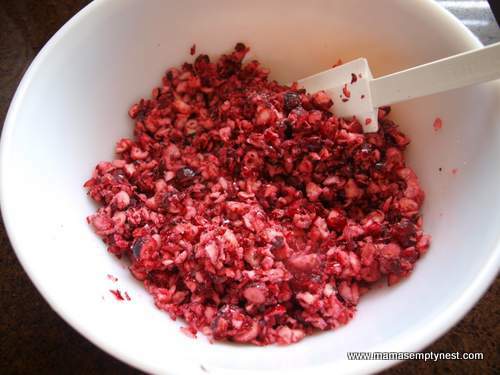 Place the cranberries into the bowl of a food processor or blender and pulse several times until the cranberries are in small pieces. If preparing the large batch, you may have to do this in multiple batches. Place the cranberries into a bowl and add the sugar. Stir well and refrigerate overnight. The next day, place the cranberry mixture into a colander and allow to drain well. Set aside. 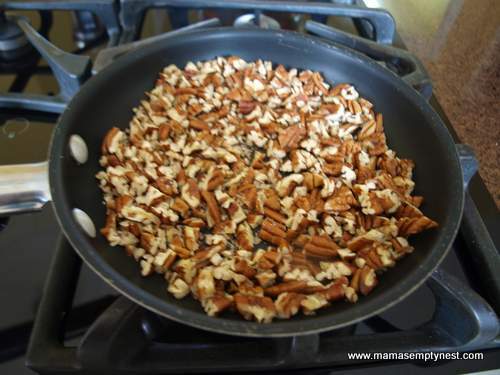 Chop and measure the pecans. Toast them by placing into a skillet over medium heat for 3 to 4 minutes or until you can smell that they are lightly toasted. Be very careful not to burn them and to stir frequently. Set aside. 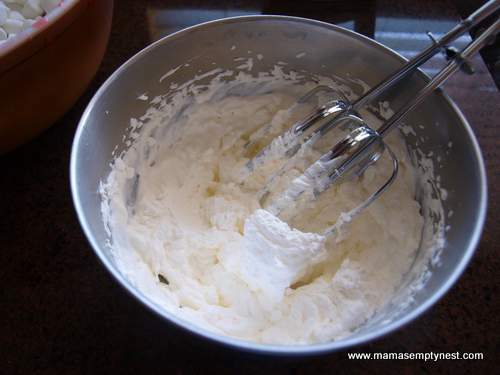 Place the whipping cream into a cold bowl and beat with a hand mixer until it forms stiff peaks. Set aside. 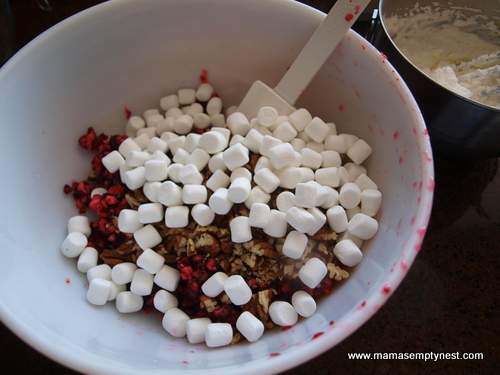 Add the pecans and miniature marshmallows to the cranberry mixture, and stir to combine well. 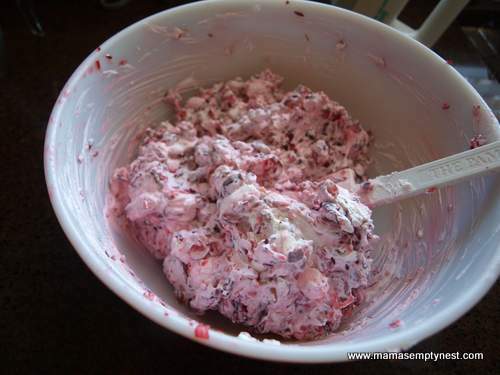 Add the whipped cream to the cranberry mixture and gently fold to combine. Once the mixture is well blended, place in the refrigerator overnight. Cranberry Salad – ready to serve. Yummy. Rinse and drain the raw cranberries. 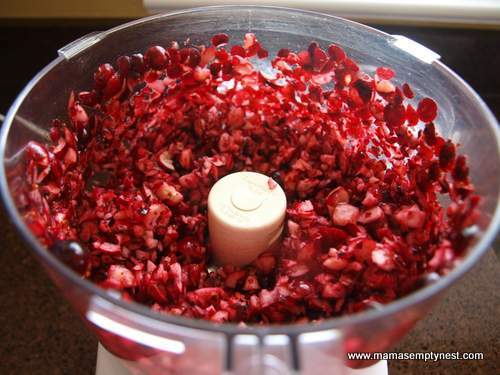 Place in the bowl of a food processor, and pulse several times until the cranberries are in small pieces. Place in bowl and stir sugar. Refrigerate overnight to allow flavors to meld. Places the cranberry mixture into a colander and allow to drain well. Set aside. Chop and measure the pecans. Place into a skillet over medium heat. Stir for 3 to 4 minutes or until you can smell that they are lightly toasted. Beat the cream in large bowl until stiff. 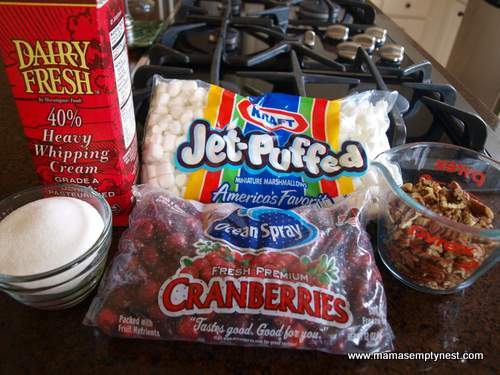 Fold in the cranberry mixture, the toasted pecans, and the marshmallows. Refrigerate overnight. Note on the sugar: The original recipe calls for 2 cups of sugar; however, my friend uses less 1½ cups, and it tastes perfectly fine so feel free to adjust the amount of sugar for your personal tastes. Note on timing: This recipe is better if you make it 2 days ahead to allow for the one night of cranberries sitting in the sugar and then the one night for the completed salad to firm up and allow the flavors to blend together. So, start on Tuesday if making for Thanksgiving dinner on Thursday! Note on number of servings: This recipe is easily halved and makes enough for more than 6 servings if made along with several other sides for Thanksgiving. This entry was posted in Food & Home and tagged Fruits, Gluten Free, Holidays, Thanksgiving. Bookmark the permalink.